Home > News > GE's Lumination™ LED Lighting Fixtures Continue to Lead the Indoor Lighting Evolution, From San Diego t..
From recessed troffers to circular pendants to suspended lighting fixtures, GE's Lumination™ LED Luminaires, a product of GE ecomaginationSM, continue to push the boundaries of indoor LED lighting systems. Ultra-thin and elegant, these fashion-forward alternatives to traditional fluorescent lighting are finding their place in office, retail and institutional spaces alike. Be it a college campus, U.K. department store or center for lighting excellence itself, GE's designer LED lighting fixtures, valued for their visually striking appearance, are equally esteemed for curbing energy costs, virtually eliminating maintenance and invigorating otherwise uninspired areas with crisp, comfortable light. When San Diego State University went in search of an energy-efficient education, it enrolled Lumination ET Series LED Luminaires for classroom lighting in three buildings on campus. 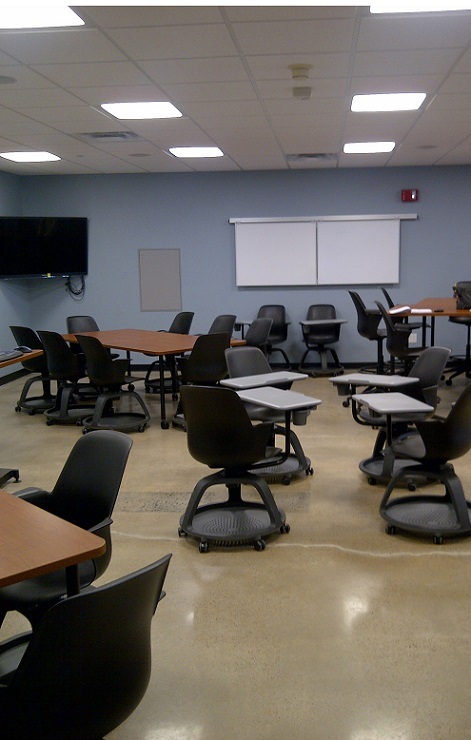 GE's Lumination 2'x2' recessed LED troffers were installed in interactive classrooms in the Adams Humanities Building and in the Department of Journalism and Media Studies. San Diego State also constructed a new 3,000-square-foot anatomy lab using GE's LED lighting solution that produces a perfectly even glow when lit, but appears completely free of a visible light source while off. “feel more open and spacious” since the switch to GE's LED lighting solution. 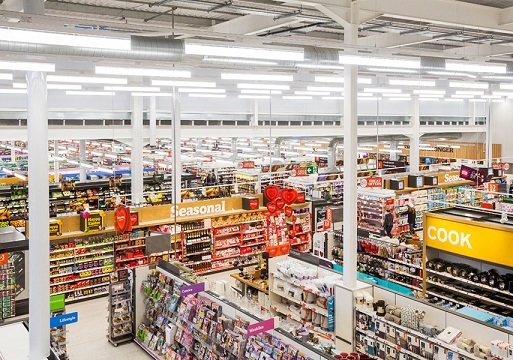 Sainsbury's, one of the largest supermarket chains in the United Kingdom, recently installed GE's new Lumination EL Series LED Luminaires at its new store in Leek, Staffordshire. The LED lighting system promises to slash energy use by more than 50 percent and reduce maintenance costs while improving the shopping experience for customers by ensuring a uniform level of light across the store. The thin and uniformly illuminated LED blades are suspended from the ceiling and powered with GE's Intrinsx™ Optical Technology that maximizes the performance, control and application efficiency of each LED diode—directing light to where it is needed, such as at the bottom shelves in aisles. other, a ground-breaking design that changes the face of retail lighting. “Good office lighting design doesn't call attention to itself but to the environment,” said Bob Karlicek, director of the Smart Lighting Engineering Research Center that is funded primarily by the National Science Foundation (NSF) and headquartered at Rensselaer Polytechnic Institute (RPI), a private research university in Troy, N.Y., where GE's Lumination EP Series LED Luminaires were installed early this year at the behest of a department head fed up with dark and dingy fluorescent fixtures. Karlicek recalled, “Our challenge was to install a state-of-the-art LED lighting solution to demonstrate what solid-state lighting can do and how it benefits occupants. We had a spot in mind in the Jonsson Engineering Center on RPI's campus. 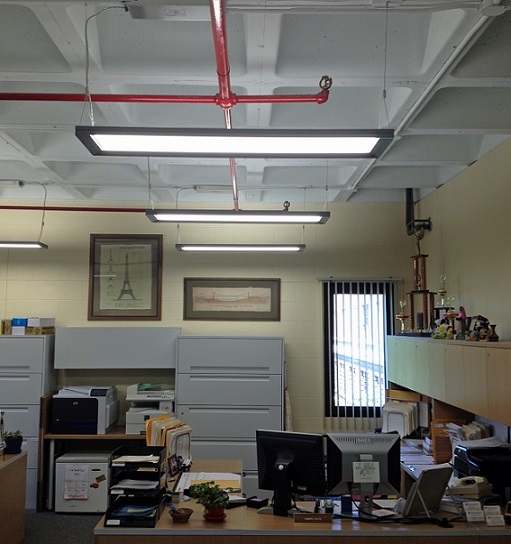 Replacing single T8 pendant-style fluorescent fixtures with GE's suspended LED lighting fixtures, we improved light quality and no longer have to replace old bulbs twice a year. GE's LED suspended luminaire can add subtle elegance to any area. Lumination EP Series LED Luminaires will be in conference rooms at the institute as well. Karlicek noted the lighting fixtures, which are surrounded by a clear, narrow band that makes the light source appear to float, produce enough indirect (side) light to pleasantly illuminate walls without glare. “We found GE's suspended LED luminaire to be a good vehicle for further research into healthy lighting applications and other advanced dynamic lighting systems that will deliver high quality light and new light-based services to people,” he added. Lighting for function and fashion? The fact is LED technology offers all-new freedom in fixture design. GE's Lumination LED linear lighting fixtures, illuminated blades and recessed troffers are realities in a new era of aesthetically pleasing options. Minimal but full-bodied, efficient but energized, a growing selection of bulb-less beauties awaits businesses and institutions of all types.